I happen to really dig Aquaman. Peter David’s unprecedented run on the title in the early ’90s won me over due to the sheer originality and complexity of character, and I’ve followed the character ever since. Of course, as he does with everything he touches, Geoff Johns returned Aquaman to his classic greatness while keeping him just as interesting over a decade later. Since I found myself in the comic book shop anyway, I figured I’d pick up Aquaman: Rebirth #1 to see what new approach DC and Dan Abnett would take with our favorite Sea King. Unfortunately, of all the Rebirth titles I’ve read so far, Aquaman struck me as the least innovative, revolutionary, or even interesting. That’s not to say Abnett wrote poorly – he didn’t. The dialogue flows well and is consistent with the characters. The art is fine as well. Both script and art progress the story resulting in a crisp, pleasurable read. My issue with the, well, issue is that I didn’t notice anything new of consequence added to the character or mythology. 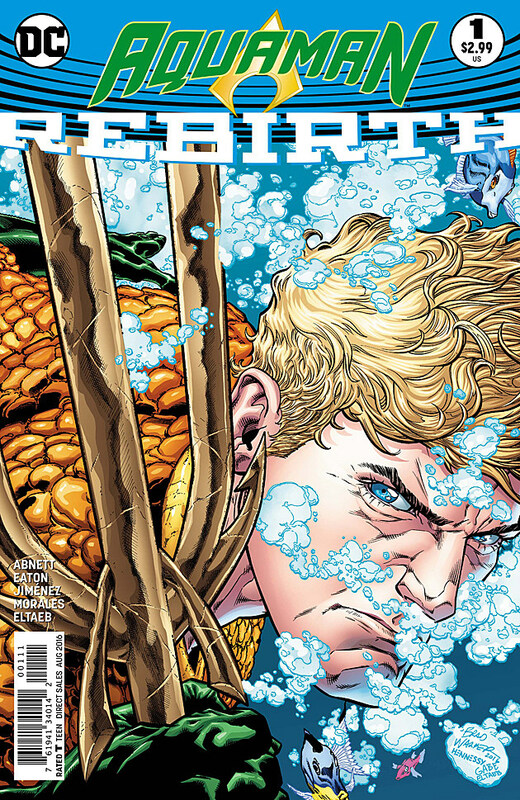 This installment seemed purely intended to catch up someone who has never read Aquaman before. We’ve sailed these waters before. So while the writing and art is well executed, the story itself offers nothing new and, consequently, makes this issue irrelevant. Wonder Woman is nothing if not a contradiction. She is warrior of peace, after all. She absolutely believes in truth and justice, yet she will fight to the death in pursuit of those things. 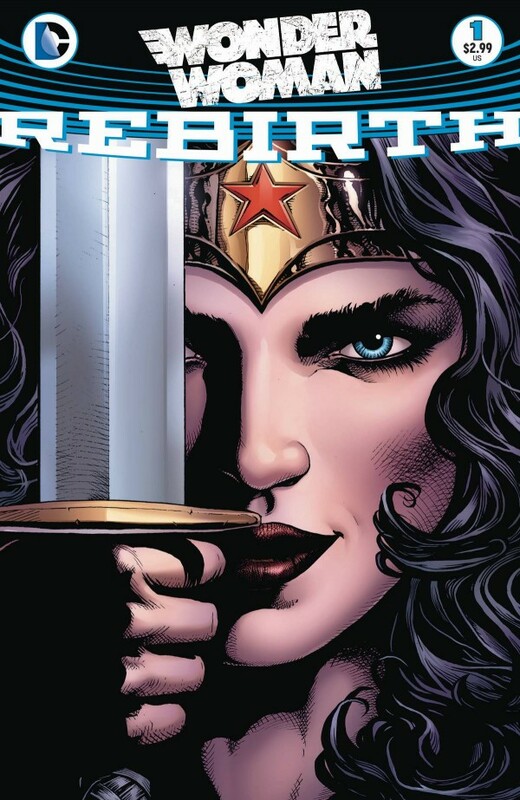 This complexity of character, an attribute that has always accompanied Wonder Woman, came especially to the forefront during Brian Azzarello’s masterful time on the title. Within the last six years, it came to light that she was not only the child of the Amazon queen but also of Zeus himself! To further add depth to the icon, she eventually became the God of War! Two artists are featured within this issue. Matthew Clark handled the Wonder Woman for whom we are familiar, and then, half way through the book, Liam Sharp takes over when Wonder Woman ditches her New 52 costume and adopts more traditional armor befitting an Amazon warrior. Consequently, this new armor is very similar to what she wore in her big screen debut last March. Rucka, like Azzarello, delivers a complicated, multifaceted Wonder Woman with a clear mission in mind. He is treating her with dignity, respect, and as the capable hero she is. Like The Flash: Rebirth #1, this issue seems integral to the overall story unfolding within the DC Universe. I left Wonder Woman after Azzarello’s departure because I didn’t care for the way the new creators handled her, but Rucka has definitely brought me back. I can’t wait to join Wonder Woman as she discovers her truth. Now fully into the DC’s “Rebirth” movement, you just knew I’d have to check out Batman: Rebirth #1. I have to say, it was a good read. I’ve always enjoyed Mikel Janin’s art, so everything looked fluid and dynamic as I would expect, and new writer Tom King quickly established his Batman as a man who knows he’s crazy for fighting against the evil sickness of the city but does it anyway. His Batman is willing to take chances and has supreme confidence in doing the impossible. Furthermore, his Batman is willing to try new things, too, as proven by his offer to Duke Thomas. It’s Thomas’ new role that has me most excited about this book, frankly, and I think that was absolutely King’s point. I’m still a little confused by the plot involving the Calendar Man, but I enjoyed the funky take on the classic villain. I’ve never seen him depicted in such a way, which King readily acknowledged within the context of the story. Of course, other than Duke’s new development, this is a Batman we know and expect, and that’s okay. The dialogue proved crisp, the story unfolded naturally with urgent pacing, and he even experimented a little with the narrative style. Snyder got a co-writing credit with this issue, but I have faith that King will maintain the excellence we’ve come to expect from the Batman title. And while I know it debuted a while ago, I have to say that I like the slight changes made to Batman’s costume. The purple inside the cape along with the yellow border around the emblem adds some much needed color to the character. It’s a little weird, but I like that and I think it suits the character well. Zero has gained a lot of buzz during the last several months. It’s typically described as a spy story with ruthless violence and a cold, detached protagonist. Its main claim to fame is that it features a different artist with each new issue. I’ll be honest. I’m not much for spy stories, but the book has garnered such acclaim, I figured I should give it a shot. First of all, yes, this is a spy story … sort of. I would actually tell you that it is a spy story with a heavy dose of subtle science fiction. In fact, while the street fights and the gunfights are graphic, violent, and disturbing, the heart of the story revolves around cybernetic enhancements, teleportation devices, and something I’m not going to give away. I like to think of Zero much the same as I think of Aliens—science fiction grounded in thrilling military realism. And, quite honestly, the revolving artist tool works tremendously. For the most part, each story is unique in terms of tone, content, and plot, and each individual artist fits those aspects perfectly. Zero has found an inventive, authentic way to get many artists involved on the title, and though I’m not sure this technique would work as well with mainstream comic books, it suits Zero well, especially because this single volume spans thirty-eight years. But, even after having said all of these positive things, I wasn’t sure until the very end of this first volume that I was hooked. I liked what I saw and read, but a book has to be very special indeed to warrant my following. The very last page, though … the very last page did it. That last page hooked me. I have to see where this title is going. This is a strange book and I mean that as a total compliment. Strange is good. Unique is appreciated. Original is commendable. Pretty Deadly is all of those things, and more. Pretty Deadly is not a linear story. Meaning, it doesn’t start at an origin, then progress to a conclusion. It sort of begins in the middle of things, offers some hints as to what occurred in the past, yet doesn’t totally explain what’s occurring in the middle. By the book’s end, you have a good idea of what happened, but not a complete one. For some books, this would be a gross misstep, but DeConnick executes it masterfully and I trust that the writer knows exactly what she’s doing. For example, by and large, we don’t know much about the characters. They are explored just enough to seem round, dynamic, real, but we don’t know everything. For a few of them, we don’t know anything. Even so, I want to know more. This is not a plot driven book, though it certainly has an interesting one. This is a story about people (of sorts). This is a rather unconventional title, and that’s why it works so well. Death personified is a major player, but that’s not necessarily breaking new ground. The story occurs in the Old West, but that’s not unheard of in the comic book world, either. But the combination of the two, coupled with mysticism, swordplay, gunfights, and a mythology-in-the-making sets Pretty Deadly apart from anything else out there at the moment. Rios’ artwork is frenetic, almost messy, yet oddly detailed. It suits the story well. At times it’s hard to tell what’s going on, especially during the brutal fight scenes, but I believe that’s actually a boon to this title. Fights usually are messy and confusing, and since this story is not delivered in a neat, tidy little package, I see no reason for the art to contradict the story’s style. The story ends on a bittersweet note, but one that certainly lays the groundwork for many interesting stories to come. 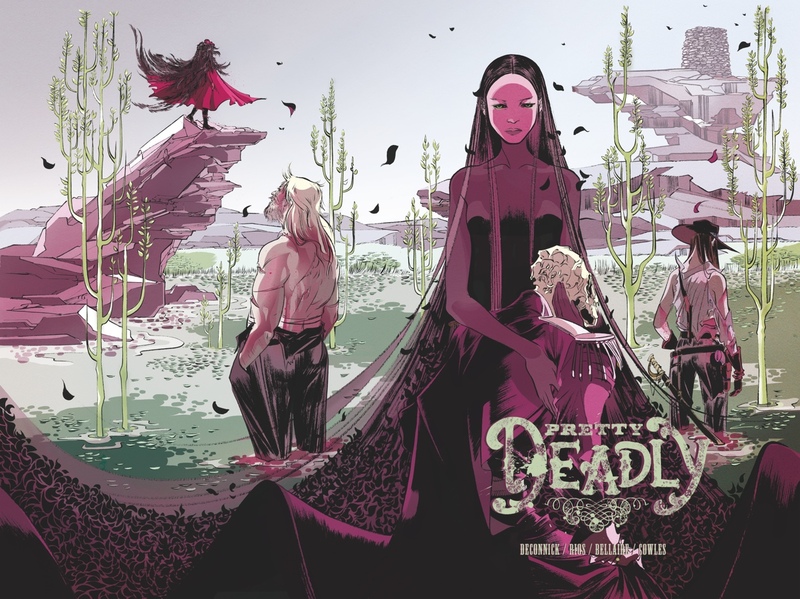 If you’re looking for something different from a comic book, something well executed and purposeful, something that will stand the test of time, I urge you to give Pretty Deadly a shot. 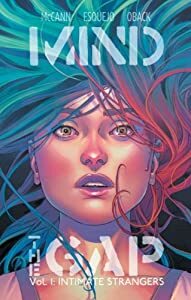 I’d heard excellent things about Mind the Gap and saw that the reviews were quite favorable, so imagine my surprise when I found myself disappointed by this first volume. I can sum up my dissatisfaction with one simple reason: I did not care about a single character. Ellis, the main character, is attacked in the subway and taken to the hospital. There she has physically entered a coma but her psyche has traveled to the astral plane where she interacts with other coma sufferers. Elle must work out her own attack as she struggles to remember even the most basic of facts about herself. The list of potential attackers is quite large: her mother, her father, her brother, her boyfriend, a few doctors, as well as what is implied to be a clandestine organization of some sort. But here’s the thing – Elle is not especially likable. Frankly, nothing about her character makes me sympathize with her nor do I really care who attacked her. This is, of course, a problem when the entire series appears to be hanging on that core plot point. The dialogue jarred me a bit as well. The problem with trying to write trendy, cool dialogue is that it becomes dated rather quickly and if a reader happens to be neither trendy nor cool (such as me), the dialogue reads incredibly hokey. Finally, the art is beautiful, but I did not find it particularly dynamic. Each panel, for the most part, depicts a person or people talking. There isn’t much that I would consider visually striking or fluid. Yes, the artist is very good at drawing people and backgrounds, but I didn’t feel it moved the story along well. Granted, it would be difficult to draw page after page of people talking and doing not much else. A protagonist who is not all that charismatic, a mystery that isn’t especially important to me, cheesy dialogue, and largely uninteresting artwork – Mind the Gap did not impress.